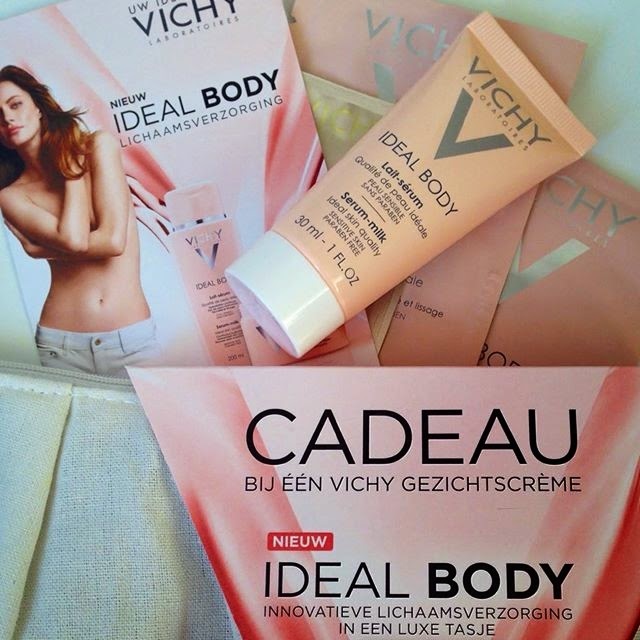 I usually buy all my skin care from the pharmacy, because I don't want to upset my sensitive skin and this is how and I received a Vichy goodie bag with some samples from the new Ideal Body line - so this is not a sponsored post or anything like that. The moment I got home, I had to pamper myself and try everything that was in the bag, first because of curiosity and second because my skin is so dry and it needs extra moisture and care. In the bag, I found 2 large samples of body balm, 1 luxe sample of serum milk (30ml ) and 1 sample of illuminating foundation and of course information about the Ideal Body line and products. I did not used the foundation sample yet, and I will probably not open it as I already know is not a matching shade. 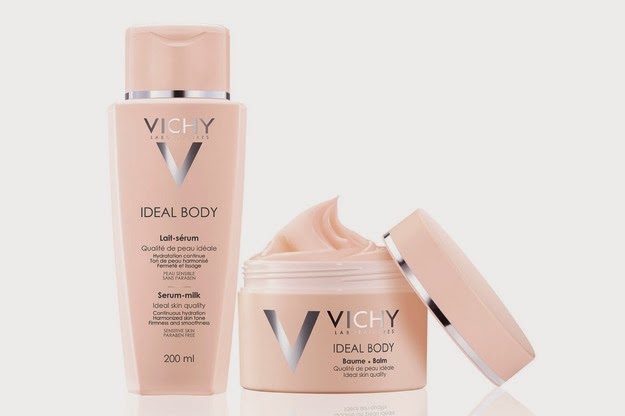 Vichy - Ideal Body Milk Serum is an emulsion-gel that leaves a fresh feeling on the skin and gives a pleasant softness and delicacy of a flowery enriched with amber perfume. You can imagine it smells so dreamy! It has top ingredients and 10 of the most amazing oils : Apricot, Passiflora, Rice Bran, Sunflower, Rose Musqueta, Macadamia, Jojoba, Black Currant Seeds, Coriander and Corn. Of course the Vichy Thermal Water does not miss and gives a soothing, fortifying and regenerating action. Hyaluronic Acid and LHA are also present, everyone probably know that the Hyaluronic Acid is a skin filler and has great hydrating and anti aging properties while LHA is famous for micro exfoliating properties. About the scent, I would describe it as a bit of Daisy from Marc Jacobs. It has high notes of : Embruns, Peach Blossom, Freesia but also a touch of Musk,Vanilla, Amber. If I am not mistaken the Body Milk Serum has illuminating micro pigments, and probably this is from where the glow comes, but don't worry is nothing shimmery or glittery, is very subtle and natural. Vichy -Ideal Body Balm has an unctuous rich texture and something like this is perfect for legs and arms, elbows, heels where the skin can be really dry. It calms and it smoothness the skin. It offers a continuous hydration that last the entire day, it protects against cold and wind and makes the skin feel firm, protected, moisturized and comfy under the layers of winter clothes. Skin feels and looks different from the very first use and touch with this balm. It really gives a velvet touch. As the Ideal Body Milk Serum, Ideal Body Balm is best to apply daily after the shower. Because of the thick and unctuous texture, the balm works better in the night, while the milk serum is perfect for fast use in the morning because after applying you can get dressed immediately. Both products are paraben-free, hypoallergenic, enriched with Vichy Thermal Spa Water and suitable for normal to dry skin, even the most sensitive. The formula of this balm contains also 10 fundamental oils, LHA and Hyaluronic Acid, just like the milk serum. I really love this body line from Vichy and I have to say I was highly impressed and surprised. My skin was happy, soft, delicate and I was happy I could test the products before purchasing a large item. I rate both products with 5 stars and I have to admit that I will buy the Ideal Body Milk Serum, because I really loved the formula and the scent and the way that makes my skin feel. 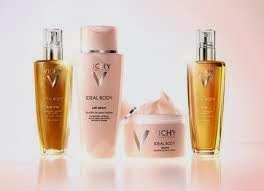 Have you tried anything from Vichy Ideal Body Line? What are your favorite body care products? Thank you for your visit and hopefully you found some great info on my blog ! very informative review! thank you for sharing! thank you so much for your visit, I am happy you found some great info :*. See you on bloglovin ! The wipes comes in different flavors which will give the fresh feel after use. The special flavors also moisturize the soft skin. Wet wipes are not very environment friendly, are they ? I really love some of their products ! Thank you so much for this review. I also like this line and will for sure try it out. I appreciate the texture, odour and the way it is applicable. Just perfect and keeps the skin moisturised for a relatively long time. I still use this line, love it for in the summer.Indeed it smells amazing and has a beautiful texture !